The night before Sock Summit, I had this horrible dream that when I got to the convention center all the yarn in the marketplace had sold out. I kept walking around the booths, not believing that it could all be gone. That, of course, didn’t happen, and I left Sock Summit with quite a haul. I arrived at the convention center about a half hour before the marketplace opened, and within two minutes Cookie A. walked past me. Then Jessica and Mary-Heather from Ravelry. 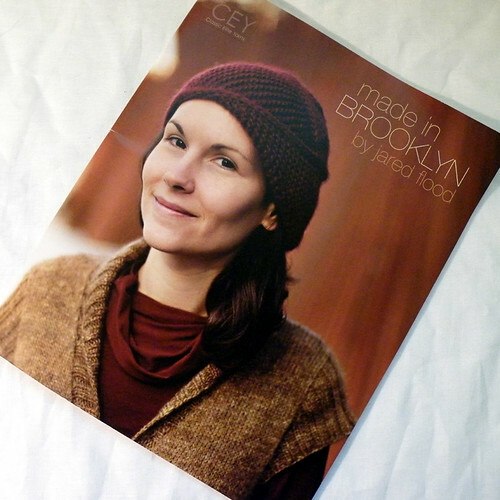 Holy knitting celebrities, y’all! I tried to play it cool and not stare, but really I wanted to go up to each of them and say something like OMGIloveyoucanwebebestfriendsnow? Everyone outside the marketplace doors was knitting and talking and laughing, and it felt so good to be amongst my people. Other knitters. Those who would understand my huge stash and get why I sometimes choose to wear wool sweaters in inappropriate weather. Once the doors opened, Pigeonroof Studios was my first stop. Krista’s yarns are some of my favorites, and the idea of buying her yarn in person is the sort of stuff my daydreams are made of. And I’m not kidding when I say that in the course of the 2 1/2 hours I was shopping I went back to her booth three times. L-R: Siren Two Sport in Green Ocean and Bitter Orange, Original Sport in Bridle, and Original Sock in Caribbean. I’m not sure what most of these will become. I already have four skeins of Bitter Orange, and with the addition of the fifth skein I’ll be making a cardigan. 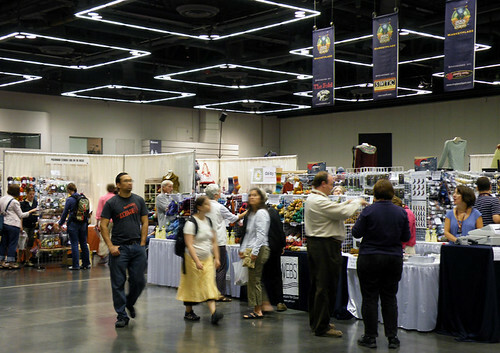 After my first visit to Pigeonroof, which took only a couple minutes, I made my way over to the Sanguine Gryphon booth. I knew her Bugga yarn was popular, but I wasn’t quite prepared for how popular. Every single skein of Bugga yarn she was going to put up for the day had sold out by the time I got there. People were walking away from the booth with their arms full of Bugga. I’m knitting a shawl out of it right now, and while it’s nice, I think the hype is more about it being hard to get rather than the quality of the yarn. Don’t get me wrong, it’s great to knit and I’d love to have a couple more skeins for my stash. It disappointed me that people were grabbing all they could, and not leaving anything for anyone else. Greed is greed, whether it’s money or yarn. Sanguine Gryphon was sharing a booth with Dragonfly Fibers, and I ended up walking away with two skeins of Dragonfly Fibers sock in Robin’s Egg, which the dyer, Kate, said was a limited edition color. 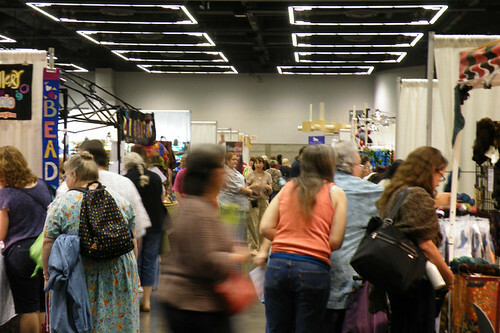 My next stop was the Blue Moon Fiber Arts booth, which I expected to be crammed and crazy, but it wasn’t bad at all. 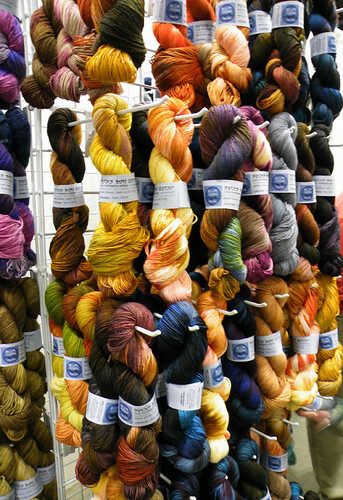 Their booth was really large, with so many choices, and when I went to get in line to pay I realized I only had one skein! 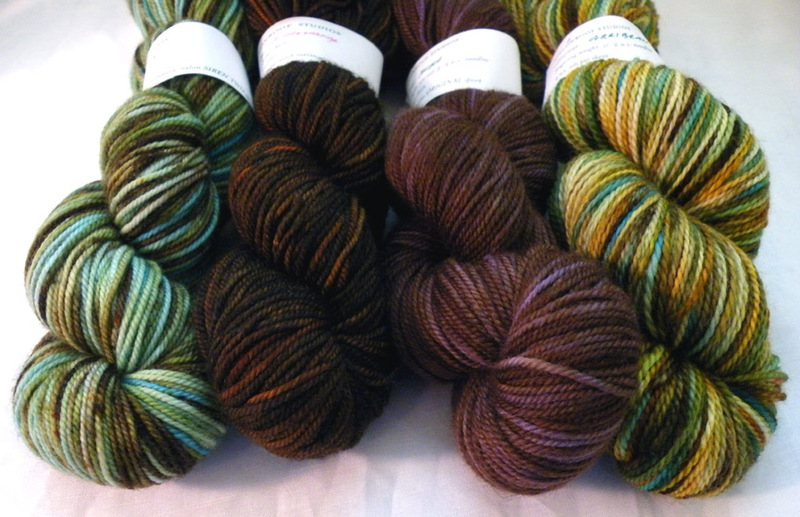 I did go back later and pick up another skein – a beautiful Rare Gem with green, purple, and several shades of pink. While I was in line the first time I met Carrie, aka Irishgirlieknits. Those of you who know me well may not believe it, but I can be quite shy, so it took a lot to introduce myself to her, but I was glad I did. She was very nice, and her arms were as full of Socks that Rock as you can imagine. From there I decided to walk to one corner of the booths, and start going up and down each row. If I counted correctly, there were around 150 booths, and truthfully it was all really overwhelming. 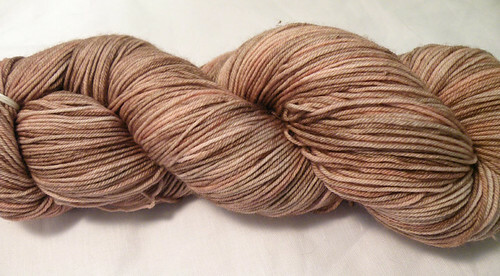 One of my favorite finds of the day is a little yarn company I’d never heard of before. It’s called Wool Candy, and the yarn there was just lovely. Bright, happy semi-solids that were an absolute joy to touch and look at, and the owner, Adrienne, was incredibly nice. In my two visits to her booth I bought three skeins. The first two skeins are her Fondant Merino sportweight in Robin’s Egg. 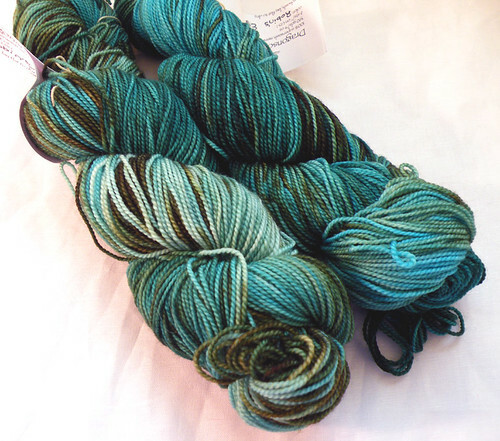 For the life of me I cannot get the skeins to photograph well, but if you look on the front page of her website you’ll see a picture. On my second trip, which was near the end of my shopping, I bought this lovely skein of Marzipan Merino sock yarn in Ice Cream. I can definitely see myself purchasing yarn from her etsy shop in the future. My next stop was the WEBS booth, which was huge! 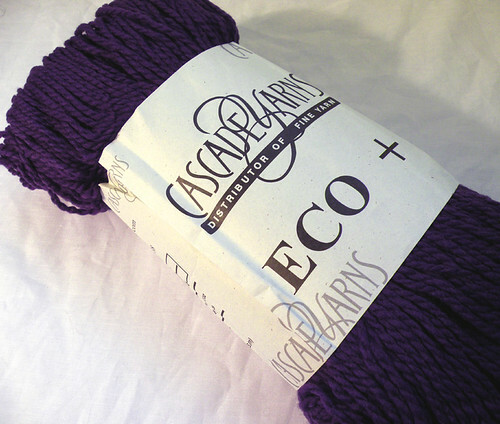 Yes, I know: you bought bulky weight yarn for a sweater? At a sock convention? It was such a good deal, perfect for a project I’ve wanted to knit for awhile now, and not only that, but Steve, the owner of WEBS, helped me pick it out. One of those skeins came home with me. It’s called Katherine, after Katherine Hepburn. My final purchase of the day was one I had been searching for the whole morning, but had somehow missed the first time around. Do I even need to say why I was so excited to get this? The Sock Summit marketplace was really amazing. I got to meet several dyers of the yarn above, plus Klaus from Crown Mountain Farms (who took the time to tell me his yarns that I wasn’t familiar with, and how they are spun – really a nice person), Amy from MadelineTosh, Robin from Pagewood Farms, and many others. I think I’ll leave you with a few shots I took while there. WoW! Can’t wait to see what you do with it all. Did you take notes? How can you remember all those names etc.?? I bet Nathan had a blast! I would have to really think what is my favorite. What is Ishbel? I saw it on your twitter, tweet, twerp whatever you call it. Wow, that’s a lot of nice yarn. I totally agree with you on the greed surrounding some of these indie dyers. I see on Ravelry how much yarn people stash away and then you find their project to stash ratio is like 5:550! And they won’t sell any of their yarn either! Or they wouldn’t sell it unless it’s double the price or something silly like that. Crazy people. There are a lot of indie dyers here with very nice yarns, but they don’t have the cult following of some of the bigger names. I can’t believe how much beautiful stuff is out there. I’m on overload! But having a blast. I wish I could have met you, but I was in class. Next time! Gorgeous yarns! Can’t wait to see that Robin’s Egg knit up. Actually, I wouldn’t know which to start with! A) I’m glad you didn’t get hurt trying to get Bugga! ! 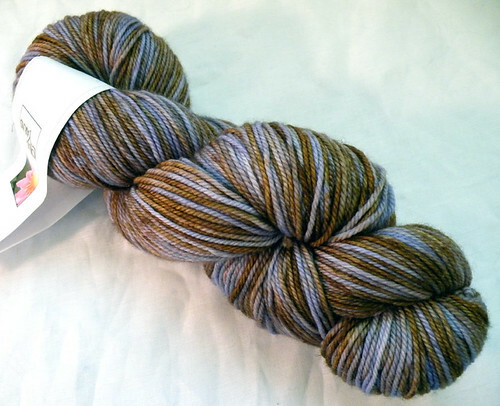 B) Since you did not acquire any Bugga!, I just went to Wool Candy and bought 3 skeins as a consolation prize. I have a feeling that I won’t be disappointed and may end up cursing you for a new yarn addiction. C) You trip photos are amazing and I’m totally jealous. That’s a nice haul! I wish I could have gone, but it’s nice to live vicariously through your blog. I especially like that Robin’s Egg yarn, and your beloved Bitter Orange. Gorgeous colors! I’m so glad you said hi! It was great to meet you!! 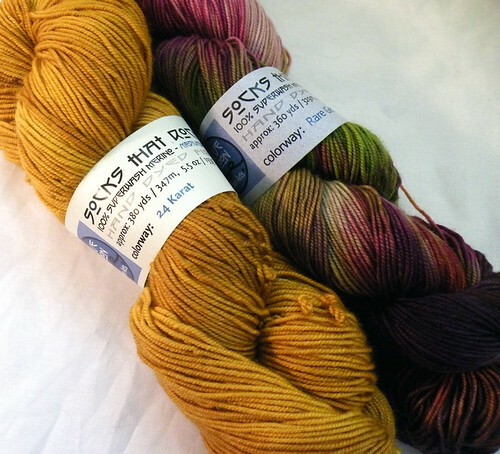 Such pretty yarns you got…I too got some Wool Candy and Lotus Yarns! So pretty! Thanks for the run-down – being a half a world away it was great to see the Summit and get an idea of yarns available.